Benefits: As Cramp bark reveals by its name, the main use as a muscle relaxer of tension and spasm. It has 2 main areas of use: firstly in muscle cramps and secondly in ovarian and uterine muscle problems. It is used specifically for uterine pains specifically for painful menstruation. Also it is used in women with a tendency to miscarriage. 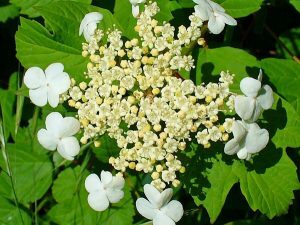 Because of its astringent action it is used for excessive blood loss during periods and especially during bleeding when associated with menopause. It also relieves constipation, colic, irritable bowel syndrome as well as physical symptoms of nervous tension. If there is joint weakness and pain in arthritis, where the pain has caused the muscles to contract until they are almost rigid it is also beneficial. It can bring remarkable relief to these symptoms. As muscles relax, blood flows to the area, waste products such as lactic acid are removed and normal function is returned. It is used as a sedative in cases of heart palpitations and to increase the blood flow. Can be helfpful in addressing problems of blood pressure. Helpful also in the treatment of asthma. Active Constituents: Hydroquinones, coumarins, tannins, resin. Pharmacological Actions: Anti-spasmodic, sedative, astringent and nervine. Contraindications: Because coumarins can be toxic, care should be exercised when using this plant on a regular basis. Definitely should not be used when other anticoagulating drugs are being taken since with will increase their action. A medical practitioner should always be informed when this herb is being used alongside pharmaceutical medication.